Got some leftover ham? 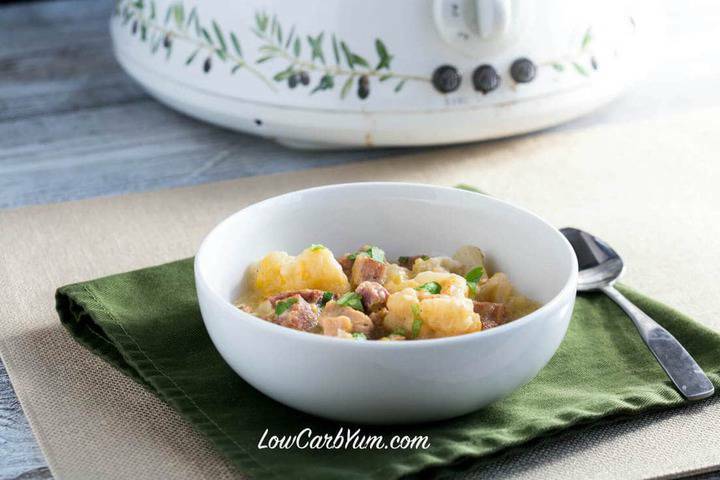 You must try this comforting low carb crock pot ham cauliflower “potato” stew. 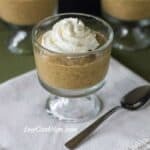 So easy to make, too! I just love the holiday season and I miss the fun times with the older two kids. Luckily, I can relive a lot of those memories with our youngest daughter who will be turning 3 in just a few weeks. If you celebrate Christmas with a traditional ham dinner, I bet you are already collecting recipes on what you are going to do with the leftovers. I come from a big family and most of them are still in the area. Even so, I always have tons of ham leftover after our holiday dinners. 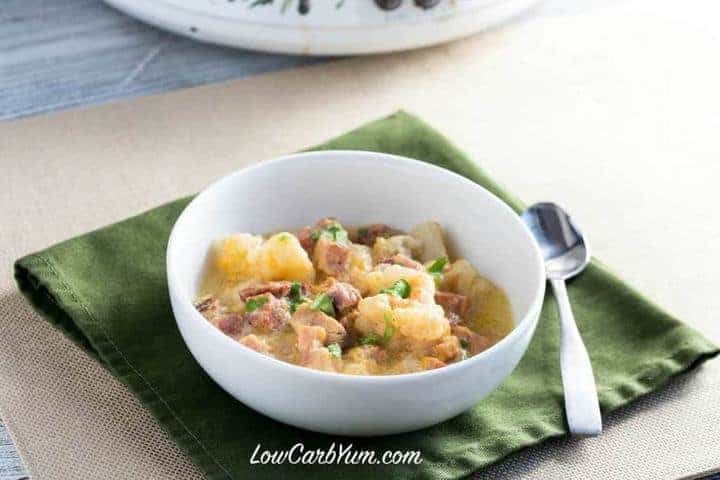 Since I’m always in need of holiday leftover recipes, I came up with this delicious low carb crock pot ham cauliflower “potato” stew. It reminds me of a thick hearty stew chock full of potatoes. 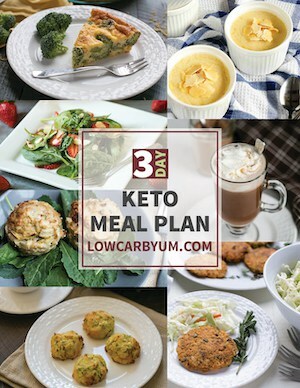 The cauliflower is really convincing as a low carb potato substitute. 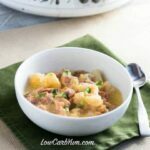 And, the absolute best part of this crock pot ham cauliflower stew is that it’s so damn easy to prepare! I always keep 1 pound bags of frozen cauliflower florets in my freezer because they are so convenient to use. Need a few reasons to keep bags of frozen cauliflower in your freezer? 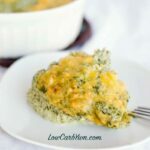 Besides this tasty low carb crock pot ham cauliflower “potato” stew, there’s my instant cauliflower mac and cheese, my cauliflower au gratin, and my cheesy cauliflower ham casserole recipes. 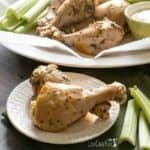 You can certainly use fresh cauliflower florets in this recipe if you prefer. But, I find it difficult to get a good head of cauliflower in the winter where we live. It’s also a bit more work to cut up the cauliflower and I don’t always have a few minutes to spare. 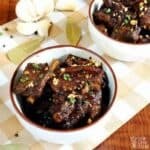 You literally just have to dump all the ingredients into your slow cooker and then hit the switch to the high cook setting. 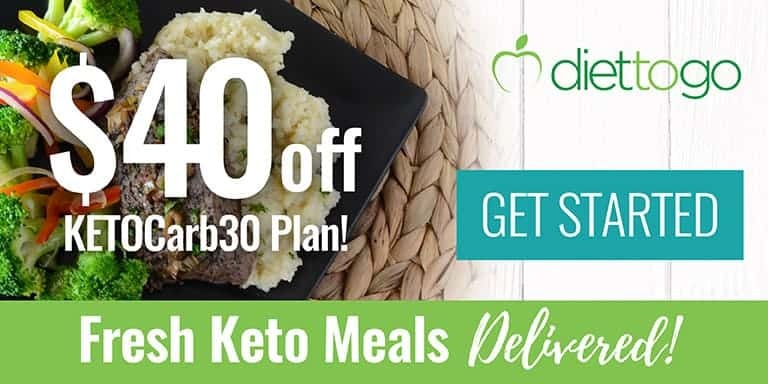 I’m sure you could could it on low if you’d like to let it cook a little longer. I made this after lunch so it would be ready for dinner so a four hour cooking time was perfect! Speaking of crock pots, I just love my 3-in-1 Slow Cooker that comes with 2-, 4-, and 6-quart crocks. 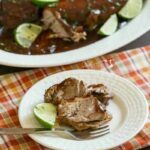 I’ve had it for several years and it’s the slow cooker that I use most often. 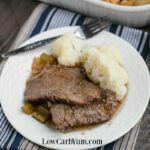 Do you have a favorite crock pot size or style? 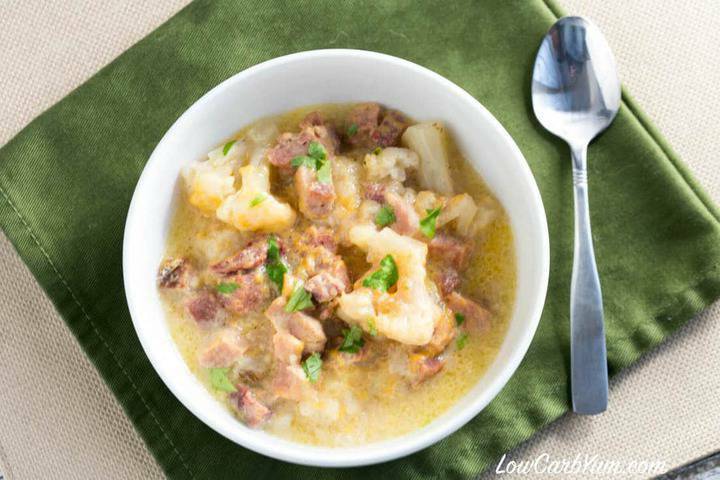 Now this crock pot ham cauliflower “potato” stew is one of those stick to the ribs kind of dishes. I know that my picky husband would absolutely love it if he could just get past the “cauliflower” part. I wonder if I cut them up into smaller pieces he wouldn’t notice what they really are. If it weren’t for looks, I could easily pass these off as potatoes. My husband has eaten my beef stew with daikon not realizing that those weren’t potatoes! How do you pass off your substitutes for the real thing? I guess that’s one disadvantage of using frozen florets. They are a bit harder to chop up if you want to disguise them in your dish. 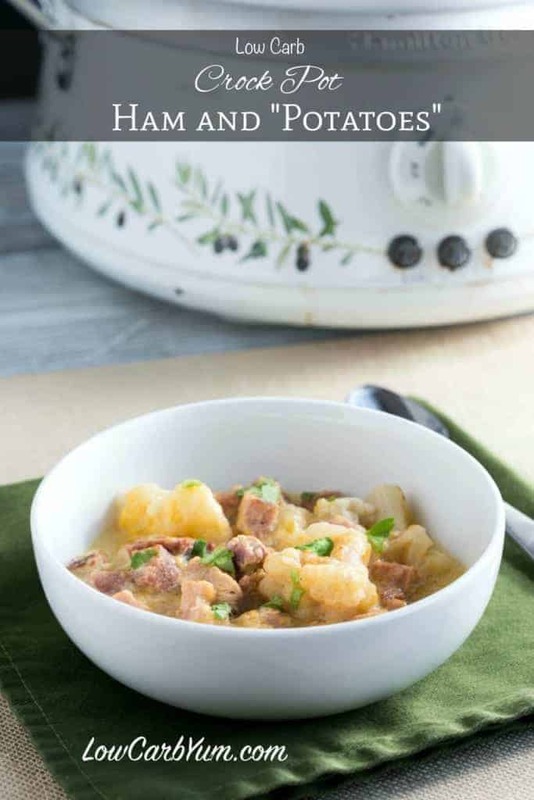 I’m actually looking forward to the ham leftovers after Christmas so I can make this yummy crock pot ham cauliflower potato stew again. I actually snuck the leftovers from this dish and put them in my lunch crock pot containers so no one would eat them. To be extra sure, I stored them in the refrigerator down in our basement. 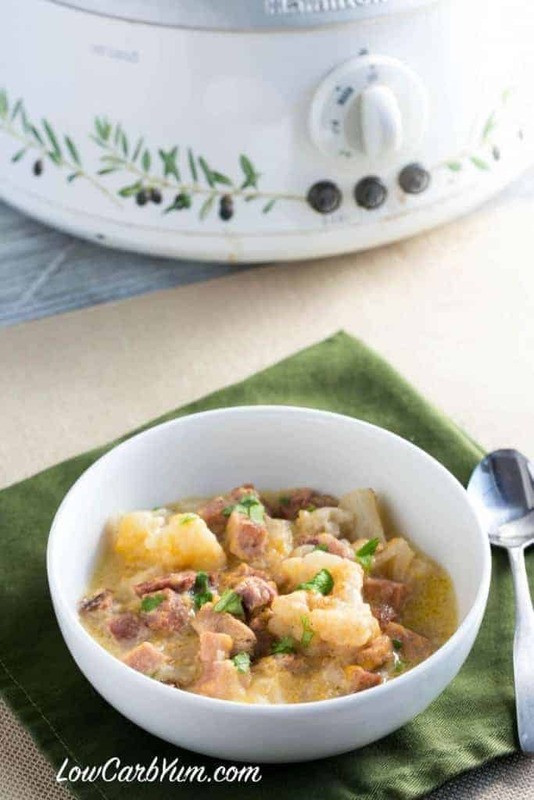 My little 2 year old was loving this crock pot ham cauliflower “potato” stew the night I served it. Since she gets away with eating way more carbs than me, I had to be sure my “special” food was put away. So glad I did. It was a treat to have for lunch at work. So, be sure to save those ham leftovers after your holiday dinner! 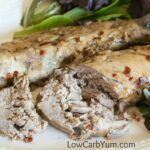 You are going to love this delicious low carb crock pot ham cauliflower “potato” recipe. Got some leftover ham? 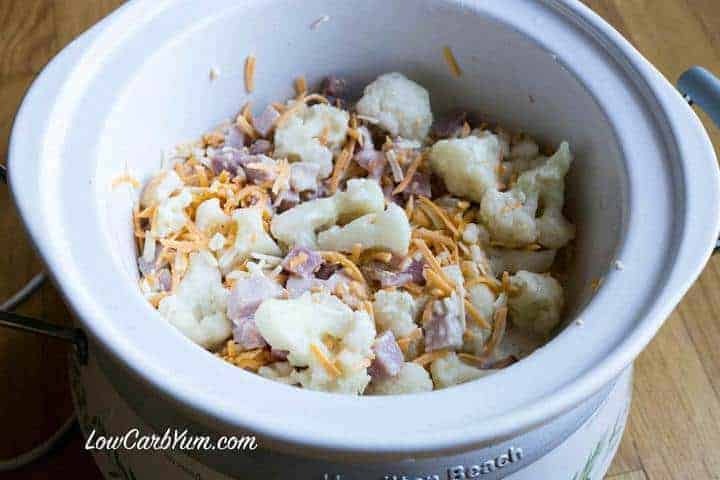 You must try this comforting low carb crock pot ham cauliflower "potato" dish. 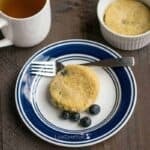 So easy to make, too! 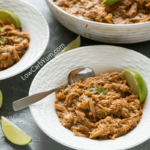 Mix all ingredients except cauliflower together in medium crockpot (I used a 4 quart). Cover then cook on High setting for 4 hours. Add in cauliflower and cook on high another 30 minutes.